1953 marked the 50th anniversary for Ford Motor Company, and is denoted on the horn button on the '53 F-Series trucks. The F-Series trucks were redesigned in 1953 with a more integrated look. The trucks took on new names as well. The F-1 became the F-100, the F-2 the F-250, and the F-3 the F-350. We also saw a new "Ford-O-Matic" automatic transmissions become an option in F-100 trucks. 1953 was the last year for the Flathead V8 in the F-Series trucks. In 1954, Ford put the overhead valve V8 engines in their trucks. There were 116,437 F-Series pickups and 9,951 panel trucks produced for the 1953 model year. 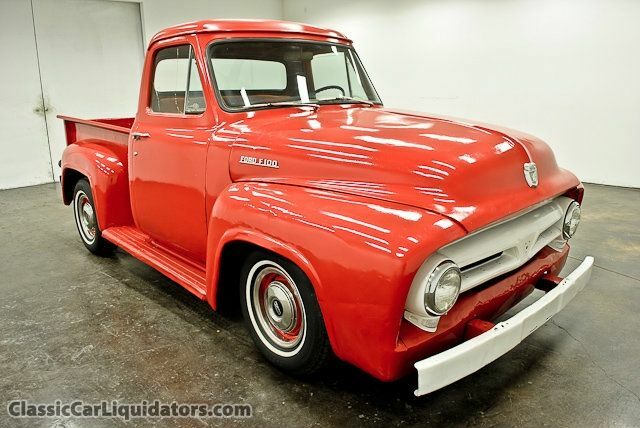 All photos of the red 1953 Ford F-100 shown in this article are used with permission from Classic Car Liquidators. Truck has Powerdyne supercharger, Belltech 3" / 4" lowering kit, 20" Colorado Custom wheels carrying Goodyear Eagle P295 40 series, Flowmaster after-cat duals, complete Navigator leather interior, custom rear roll pan, and the amazing retro 1953 front end. The grill is from an actual 1953 ambulance. Powerdyne Supercharger (6psi on stock 4.6L). K&N hi-flow intake gets the breathing in right. A few things needed moved to accommodate lowered and squeezed engine compartment. What can you say other than "wow"! ?